Background: This integrative review was aimed to examine in literature and integrate the determinants of nurses' organizational commitment in hospital settings. Materials and Methods: In this study, an integrative review of the literature was used. The search strategy began with six electronic databases (e.g. CINAHL and Medline). Considering the inclusion criteria, published studies that examined the factors influencing nurses' organizational commitment in the timeframe of 2000 through 2013 were chosen. Data extraction and analysis were completed on all included studies. The final sample for this integrative review comprised 33 studies. Results: Based on common meanings and central issues, 63 different factors contributing to nurses' organizational commitment were integrated and grouped into four main categories: Personal characteristics and traits of nurses, leadership and management style and behavior, perception of organizational context, and characteristics of job and work environment. Conclusions: In general, categories emerged in this study could be useful for formulating initiatives to stimulate nurses' OC. However, little is known about the relative significance of each identified factor among nurses working in different countries. Qualitative research is recommended for narrowing this gap. Future research should be directed to examine the psychometric properties of the organizational scales for nurses in different cultures. It can be assumed that factors influencing OC may change over time. That is because nurses continue to experience changes in role and function in the workplace. Carver and Candela emphasize on each generation's unique perspective of OC. It is extremely important for nurse managers to understand the influencing factors on the OC of the current nursing workforce. Thus, the current review was aimed to assess in literature and integrate the determinants of nurses' OC in hospital settings. A systematic search was conducted using six online databases: CINAHL, Medline, ERIC, PROQUEST, and two Iranian databases: Iran Medex, and Scientific Information Database. Keywords used for this review were "organisational commitment" or "organizational commitment" with limitation to studies conducted in nursing. The inclusion criteria were: (a) Works written in English or Persian in the timeframe of 2000 through March 2013, (b) the inclusion of the search term in the title or the keywords, (c) scholarly works published in a peer-reviewed journals, and (d) studies including nurses who worked only in hospitals. Studies that used a mixed sample of nurses along with other healthcare workers were included if only the studies consistently analyzed and reported nurses' information separately from other participants. The studies that were excluded included those described in one-page reviews, letters, and those published in other than the selected languages. Furthermore, additional papers from reference lists of the studies reviewed were identified. The purpose of this study was to identify the determinants of nurses' OC; therefore, those studies that applied experimental design were excluded with the goal of improved understanding of factors influencing OC in the absence of variable manipulation. The search was completed in April 2013. The initial search resulted in a sample of 594 articles (464 English and 130 Persian articles). In light of the inclusion and exclusion criteria, 33 studies remained in our review [Table 1]. In the current review, studies were evaluated for quality using the AACN revised evidence-leveling system. The new AACN structure consists of six rating levels. Meta-analyses and meta-syntheses are placed as the highest levels of evidence (Level A). Level B includes both randomized and non-randomized well-designed controlled studies. Level C encompasses qualitative studies, descriptive or correlational studies, integrative reviews, systematic reviews, or randomized controlled trials with inconsistent results. Level D indicates peer-reviewed professional organizational standards. Level E signifies theory-based evidence from multiple-case reports and expert opinion, and Level M is used to identify manufacturer recommendations. In the current review, 32 out of the 33 included studies (96.9%) used a quantitative cross-sectional design. McNeese-Smith used a qualitative method, however. Therefore, as presented in [Table 1], almost all the included studies were descriptive in nature with most receiving a level C rating. The data were analyzed with consideration of purpose, methods, and findings of the reviewed studies. Taking into consideration the main findings, descriptions of determinants of OC were first extracted and the way these factors affected OC was identified and summarized. Then, based on common meanings and central issues of these findings, they were organized and integrated as categories and themes. A summary of four main categories and their themes was emerged and are presented in [Table 2]. The 15-item OC scale developed by Porter et al. (1974) was used in Chiok Foong Loke's study. Jalonen et al. used a single question to inquire about OC. Finally, in the study of Chang et al.,  OC was measured by Blauetal's (1993) tool, which comprised six items. In the majority of studies reviewed, nurses' OC was measured using similar tools. Thus, it should be said that the authors had a similar view of the empirical referents of OC. On the one hand, it can be considered as a potential strength because the results of such studies enable researchers to make international comparisons. In light of the statistical analysis, all the reviewed studies except three ,, used multiple regression analysis. Moreover, a considerable number of researchers used the Structural Equation Modeling (SEM). ,,,,,, It is obvious that applying such statistical technique can be helpful to test the proposed models of OC in nursing field and, consequently, to develop the body of knowledge in nursing. Some included studies were guided by a theoretical framework ,,,,, which enhances the validity of the studies. The category of personal characteristics and traits of nurses encompasses two themes including a) biopsychosocial parameters and b) personal and family life. Regarding the biopsychosocial parameters theme, age was positively correlated with OC in three studies. ,, Also, age was found to be negatively associated with calculative commitment in one study. In Tsai and Wu's study, OC was not related to age. These findings indicate a need for more exploration of impact of age on OC. Two themes were identified within this category: Organization's norms and performance and organizational policies and procedures. The organizational policies and procedures theme encompasses two factors: Permanent job status/job security and monetary benefits. Change from temporary job status to a permanent one predicted sustained OC of the staff nurses in two studies. , Consistent with this finding, job security was one of the emerged factors in the study conducted by McNeese-Smith. Also, in the above-mentioned study, nurses cited monetary benefits as one of the factors shaping high-level commitment. This category included three themes: Growth and development, content and organization of tasks, and mutual respect. Several factors related to the nature of nurses' tasks and work environment conditions were integrated into the content and organization of tasks theme. A favorable perception of work environment conditions, such as interpersonal relationships, managerial support, and regular routines, was found to be positively associated with higher levels of affective commitment in two studies. , Job control  and job rotation  were cited as significant determinants of OC. In two of the included studies, the perception of role conflict and ambiguity were negatively related to nurses' OC. , Also, significant positive relationships between OC, professional privilege,  workplace spirituality,  and clinical challenges  were reported. In McNeese-Smith's study,  difficult or repetitive patient care negatively influenced OC. In addition, time pressure,  job stress, , and overload  were found to be negative determinants of OC. The purpose of this integrative review was to examine in literature and integrate the determinants of nurses' OC in hospital settings. Different factors from 33 included studies were integrated into nine themes. Afterward, based on the common meanings and the relationships between the themes, this rather large number of themes was combined into four main categories. The categories included: Personal characteristics and traits of nurses, leadership and management style and behavior, perception of organizational context, and characteristics of job and work environment. Factors within each theme were found to positively or negatively influence the OC of nurses working in hospitals. The current review also showed that research was inconsistent with respect to the correlation between some personal factors such as age and OC. A possible argument is that these findings may be context-specific and should be taken into account when managers want to design initiatives to stimulate nurses' OC. In other words, issues important for a specific age group of nurses in one country may not be as much important for nurses of the same age group in another country. In addition, as noted previously, researchers believed that different generations of nurses have unique perspectives of OC. Employees born into a generational cohort of peers have similar life experiences. These experiences have strong effects on their work values and needs as well as their expectations of employers, which in turn impact the influential parameters of employees' OC. As an example, Carver and Candela  believed that nurses born during 1961-1981 prefer working independently, while younger ones enjoy working in groups. So, it can be expected the integrated findings in the current review provide a foundation for comparison of factors that contribute to OC of different generations of nurses. Further, these findings have potential for developing the body of knowledge related to OC in nursing context and clarifying theoretical basis of this concept. As another finding in this study, it became evident that all the tools applied for measuring nurses' OC were developed in western countries. It has been suggested that the concept of OC is culturally specific. Since work culture varies in different countries, the conceptual framework and operationalization of commitment may be understood differently across various countries. It is not meant that tools developed in western countries are not valid in other countries such as Iran; it simply means that these tools need to be tested more in other cultures before their validity can be fully established. On the other hand, healthcare organizations in different countries face different challenges, which in turn impact the OC of employees. Qualitative research has the potential to offer some insights into nurses' experiences of OC in different countries and cultures and, hence, to provide valuable context-based data. Most of the included studies used a cross-sectional design, and hence, the potential reciprocal relationships between revealed determinants and nurses' OC cannot be fully interpreted causally. Therefore, as far as possible, future research could be conducted using longitudinal designs to further consider the impact of the specific determinants of OC. We acknowledge that this review has some limitations. In the present review, only those studies published in English and Persian were included. This may have resulted in the omission of several valuable studies. Also, it is evident that OC is an important construct in turnover research. Considering the selected inclusion criteria in this review, we may have possibly missed research studies that have looked at the antecedents and consequences of OC in the context of turnover. Nurses' OC is influenced by various factors related to personal characteristics, leadership and management, organizational context, and characteristics of job and work environment. Given the different work cultures across the world, nevertheless, little is known about the relative significance of each factor among nurses working in different countries. These issues should be taken into account in planning the evidence-based strategies to improve nurses' OC. For this end, qualitative research will be an invaluable tool. These studies will capture the real perception of nurses about OC and specific factors impacting it. The findings of the present study could be useful for formulating initiatives to stimulate nurses' OC. In future researches, reviewing this construct, specifically in the context of turnover, can be considered. As the next step, researchers are recommended to plan research studies that will reveal the causes of high OC on which organizations can influence directly. Future research can also be designed to compare the influential factors on OC in different generations of nurses in countries such as Iran with its specific social and economical context. Finally, regarding the used scales for measuring the OC, future research can be directed to test the psychometric properties of the OC scales for nurses in the different societies or cultures. Hayes LJ, O′Brien-Pallas L, Duffield C, Shamian J, Buchan J, Hughes F, et al. Nurse turnover: A literature review. Int J Nurs Stud 2006;43:237-63. Simon M, Müller BH, Hasselhorn HM. 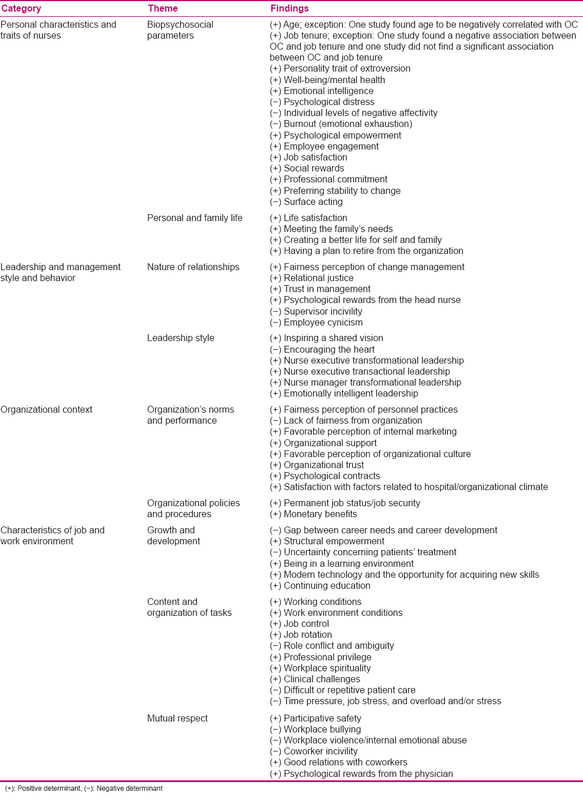 Leaving the organization or the profession - a multilevel analysis of nurses′ intentions. J Adv Nurs 2010;66:616-26. Chen ZX, Francesco AM. The relationship between the three components of commitment and employee performance in China. J Vocat Behav 2003;62:490-510. McNeese-Smith D. Job satisfaction, productivity, and organizational commitment. The result of leadership. J Nurs Adm 1995;25:17-29. Zangaro GA. Organizational commitment: A concept analysis. Nurs Forum 2001;36:14-22. Blau GJ, Boal KB. Conceptualizing how job involvement and organizational commitment affect turnover and absenteeism. Acad Manage Rev 1978;12:288-300. Price S. Future directions for career choice research in nursing: A discussion paper. Int J Nurs Stud 2009;46:268-76. Mowday RT, Steers RM, Porter LW. The measurement of organizational commitment. J Vocat Behav1979;14:224-47. Carver L, Candela L. Attaining organizational commitment across different generations of nurses. J Nurs Manag 2008;16:984-91. Armola RR, Bourgault AM, Halm MA, Board RM, Bucher L, Harrington L, et al. AACN levels of evidence: What′s new? Crit Care Nurse 2009;29:70-3. Olsen JM. An integrative review of literature on the determinants of physical activity among rural women. Public Health Nurs 2013;30:288-311. Ahmed N, Oranye NO. Empowerment, job satisfaction and organizational commitment: A comparative analysis of nurses working in Malaysia and England. J Nurs Manag 2010;18:582-91. Bahrami MA, Emamrezaei A, Sattar E, Ranjbar Ezzatabadi M, Dehghani Tafti A. The comparative survey of organizational commitment based on personal traits: A case study on nurses in Yazd training hospitals. Toloo-e- Behesht 2010;9:44-56. Bakhshi Soreshjani L. Realtionship between emotional intelligence and mental health among teachers, nurses and employees. New Find Psychol 2010;5:23-33. Brunetto Y, Xerri M, Shriberg A, Farr-Wharton R, Shacklock K, Newman S, et al. The impact of workplace relationships on engagement, well-being, commitment and turnover for nurses in Australia and the USA. J Adv Nurs 2013;69:2786-99. Camerino D, Estryn-Behar M, Conway PM, van Der Heijden BI, Hasselhorn HM. Work-related factors and violence among nursing staff in the European NEXT study: A longitudinal cohort study. Int J Nurs Stud 2008;45:35-50. Chang CS, Chang HH. Effects of internal marketing on nurse job satisfaction and organizational commitment: Example of medical centers in Southern Taiwan. J Nurs Res 2007;15:265-74. Chang PL, Chou YC, Cheng FC. Career needs, career development programmes, organizational commitment and turnover intention of nurses in Taiwan. J Nurs Manag 2007;15:801-10. Chiok Foong Loke J. Leadership behaviours: Effects on job satisfaction, productivity and organizational commitment. J Nurs Manag 2001;9:191-204. Cho J, Laschinger HK, Wong C. Workplace empowerment, work engagement and organizational commitment of new graduate nurses. Nurs Leadersh (Tor Ont) 2006;19:43-60. De Gieter S, De Cooman R, Pepermans R, Jegers M. The psychological reward satisfaction scale: Developing and psychometric testing two refined subscales for nurses. J Adv Nurs 2010; 66:911-22. Demir D, Rodwell J. Psychosocial antecedents and consequences of workplace aggression for hospital nurses. J Nurs Scholarsh 2012;44:376-84. English B, Chalon C. Strengthening affective organizational commitment: The influence of fairness perceptions of management practices and underlying employee cynicism. Health Care Manag (Frederick) 2011;30:29-35. Gregory DM, Way CY, LeFort S, Barrett BJ, Parfrey PS. Predictors of registered nurses′ OC and intent to stay. Health Care Manage Rev 2007;32:119-27. Han SS, Moon SJ, Yun EK. Empowerment, job satisfaction, and organizational commitment: Comparison of permanent and temporary nurses in Korea. Appl Nurs Res 2009;22:e15-20. Jahangir F, Shokrpour N. Three components of organizational commitment and job satisfaction of hospital nurses in Iran. Health Care Manag (Frederick) 2009;28:375-80. Jalonen P, Virtanen M, Vahtera J, Elovainio M, Kivimaki M. Predictors of sustained organizational commitment among nurses with temporary job contracts. J Nurs Adm 2006;36:268-76. Kafashpour A, Mortazavi S, Pour S. Impact of psychological contracts on organizational trust and commitment of nurses in Ghaem hospital - Mashhad province Hospital. JHOSP 2013;11:64-72. Kazemipour F, Mohamad Amin S, Pourseidi B. Relationship between workplace spirituality and organizational citizenship behavior among nurses through mediation of affective organizational commitment. J Nurs Scholarsh 2012;44:302-10. Laschinger HK, Finegan J, Shamian J. The impact of workplace empowerment, organizational trust on staff nurses′ work satisfaction and organizational commitment. Health Care Manage Rev 2001;26:7-23. Laschinger HK, Finegan J, Wilk P. Context matters: The impact of unit leadership and empowerment on nurses′ organizational commitment. J Nurs Adm 2009;39:228-35. Leach LS. Nurse executive transformational leadership and organizational commitment. J Nurs Adm 2005;35:228-37. Liou SR, Cheng CY. Organisational climate, organisational commitment and intention to leave amongst hospital nurses in Taiwan. J Clinic Nurs 2010;19:1635-44. Liou SR, Grobe SJ. Perception of practice environment, organizational commitment, and intention to leave among Asian nurses working in U.S. hospitals. J Nurses Staff Dev 2008;24:276-82. Lu H, While AE, Barriball KL. A model of job satisfaction of nurses: A reflection of nurses′ working lives in Mainland China. J Adv Nurs 2007;58:468-79. McNeese-Smith DK. A Nursing Shortage: Building organizational commitment among Nurses. J Healthc Manag 2001;46:173-87. Smith LM, Andrusyszyn MA, Spence Laschinger HK. Effects of workplace incivility and empowerment on newly-graduated nurses′ organizational commitment. J Nurs Manag 2010;18:1004-15. Takase M, Yamashita N, Oba K. Nurses′ leaving intentions: Antecedents and mediating factors. J Adv Nurs 2008;62:295-306. Tsai Y, Wu SW. Using internal marketing to improve organizational commitment and service quality. J Adv Nurs 2011;67:2593-604. Vanaki Z, Vagharseyyedin SA. Organizational commitment, work environment conditions, and life satisfaction among Iranian nurses. Nurs Health Sci 2009;11:404-9. Yang FH, Chang CC. Emotional labour, job satisfaction and organizational commitment amongst clinical nurses: A questionnaire survey. Int J Nurs Stud 2008;45:879-87. Young-Ritchie C, Spence Laschinger HK, Wong C. The effects of emotionally intelligent leadership behaviour on emergency staff nurses′ workplace empowerment and organizational commitment. Nurs Leadersh (Tor Ont) 2009;22:70-85. Meyer JP, Allen NJ. A three-component conceptualization of organizational commitment. Hum Resour Manage R 1991;1:61-98. Moeini B, Hazavehei SM, Hosseini Z, Aghamolaei T, Moghimbeigi A. The impact of cognitive-behavioral stress management training program on job stress in hospital nurses: Applying PRECEDE Model. J Res Health Sci 2011;11:114-20. Spence Laschinger HK, Leiter MP, Day A, Gilin-Oore D, Mackinnon SP. Building empowering work environments that foster civility and organizational trust: Testing an intervention. Nurs Res 2012;61:316-25. Scarnera P, Bosco A, Soleti E, Lancioni GE. Preventing burnout in mental health workers at interpersonal level: An Italian pilot study. Community Ment Health J 2009;45:222-7. Hall LM, Doran D, Pink L. Outcomes of interventions to improve hospital nursing work environments. J Nurs Adm 2008;38:40-6. Chang LC, Liu CH, Yen EH. Effects of an empowerment-based education program for public health nurses in Taiwan. J Clin Nurs 2008;17:2782-90. Ojian P, Vanaki Z, Hajizadeh E, Parandeh A, Sharifnia H. Effect of management development program based on concept mapping for head nurses on their leadership style and its′ effectiveness. Iran J Nurs Vis 2012;3:65-74. Cohen A. Dynamics between occupational and organizational commitment in the context of flexible labor markets: A review of the literature and suggestions for a future research agenda. Institut Technik und Bilung 2007. Available from: http://doku.iab.de/externe/2007/k070503p06.pdf. [Last accessed on 2014 Sep 29]. Wagner CM. Organizational commitment as a predictor variable in nursing turnover research: Literature review. J Adv Nurs 2007;60:235-47.